Life changed dramatically for Jamie Fletcher four years ago, when her son Zach passed away suddenly in an accident. Grief struck her, and she struggled to find reasons to get out of bed each morning. She found a bit of grace in a mission to help other grieving families. 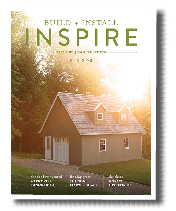 Jamie's shed is a 10'x12' Skyline with SmartSide in Soft White and custom shingles, a 36" fiberglass entry door with 15 lights, 66" Craftsman Pushbar doors, eight 24"x36" aluminum windows, two 24" flower boxes, a large cupola, lofts and a workbench. 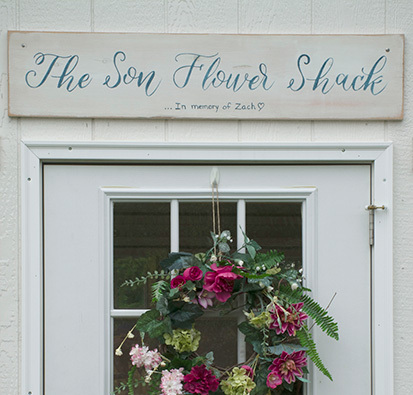 The inspiration for “My Son Flower” and “The Son Flower Shack” came from a gerbera daisy Zach gifted to Jamie the Mother’s Day before he passed. She took some seeds from the daisy to plant and instead of gerbera daisies, a sunflower grew. Shortly after the blooming of the sunflower, she began painting pots and planting flowers out of her garage to sell at farmer’s markets and art walks and would take the proceeds to make comfort packages for families who also lost children. This mission has allowed her to impact about twenty families over the last four years. 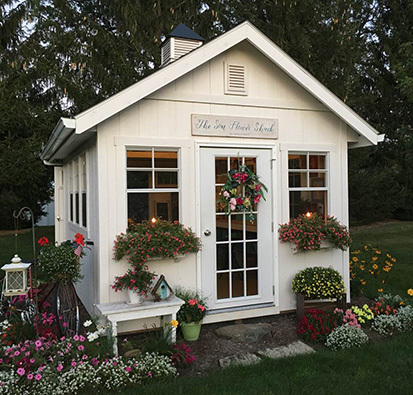 The addition of the JDM shed helped Jamie’s initiative bloom, as she moved from the garage to her “Son Flower Shack.” After visiting with a JDM dealer close to ten times, she selected a Skyline, the perfect style. She knew elements she wanted and turned her vision into a reality. 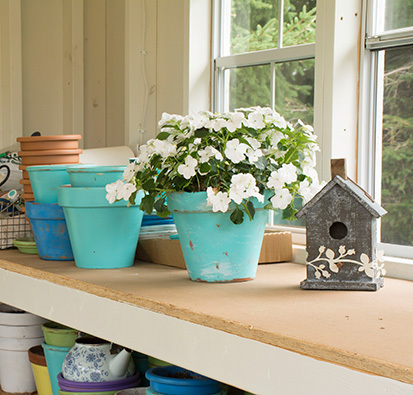 “I wanted lots of windows, a potting bench, and a single french door,” Jamie shared. Her shed sits close to her home and has stones from her grandfather’s farm as a pathway up to it. There are flower boxes on the outside that she decorates seasonally. Through the single french door, an old green shutter leans along the back with a sunflower wreath hanging on it, and many painted pots fill the space. The walls are adorned with a cross, paintings from a local friend, and, of course, a photo of Zach surrounded by sunflowers. People can come to the Son Flower Shack to purchase a plant, and some of these customers have had a spiritual impact on Jamie’s life. “I’ve heard different stories, and each is touched with a little bit of grace,” Jamie said. Jamie recalled a feeling a pure happiness when she saw the JDM crew pull up with the Son Flower Shack. It has helped her mission become more spiritual and a graceful experience. She can definitely feel her son’s presence, as she does so much to show a bit of kindness to others.